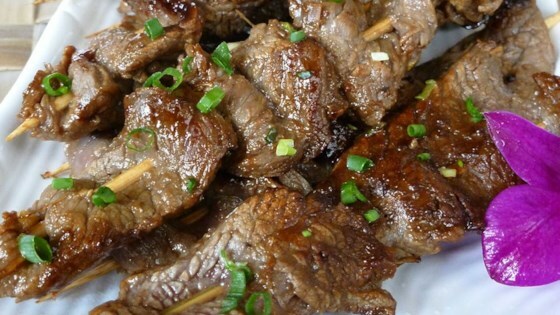 "Ginger flavored beef skewers are excellent as an appetizer as well as an entree." In a small bowl, mix together hoisin sauce, sherry, soy sauce, barbeque sauce, green onions, garlic, and ginger. Cut flank steak across grain on a diagonal into 1/4 inch slices. Place slices in a 1 gallon resealable plastic bag. Pour hoisin sauce mixture over slices, and mix well. Refrigerate 2 hours, or overnight. Preheat an outdoor grill for high heat. Discard marinade, and thread steak on skewers. Oil the grill grate. Grill skewers 3 minutes per side, or to desired doneness.